EJ Morris Master Photographer , ( Retired 3 Years ago ) is among a very small group that have won the Best of Erie Award for NINE consecutive years. This distinction has qualified EJ Morris Master Photographer for the 2016 Erie Business Hall of Fame. 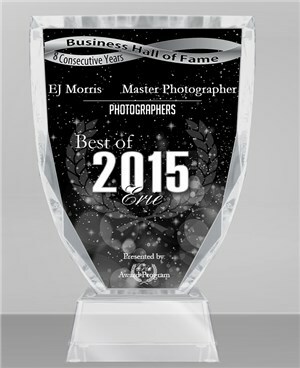 ( DATELINE 2015 ) EJ Morris, Master Photographer is inducted into the Erie Business “Hall of Fame” . 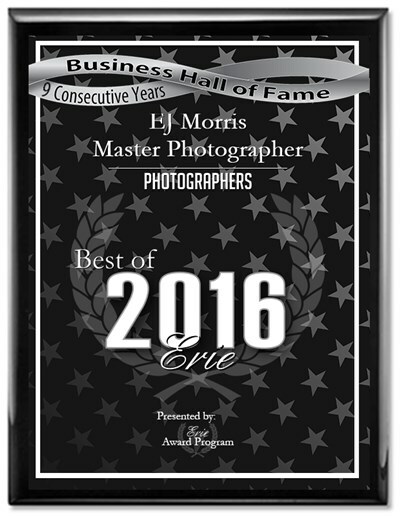 EJ Morris Master Photographer is among a very small group of companies that have won the Best of Erie Award for EIGHT consecutive years. This distinction has qualified EJ Morris, Master Photographer, for induction into the 2015 Erie Business HALL OF FAME. Each year, the Erie Award Program identifies companies that we believe have achieved exceptional marketing success in their local community and business category. These are local companies that enhance the positive image of small business through service to their customers and our community. These exceptional companies help make the Erie area a great place to live, work and play. The Erie Award Program was established to recognize the best of local businesses in our community. Our organization works exclusively with local business owners, trade groups, professional associations and other business advertising and marketing groups. Our mission is to recognize the small business community's contributions to the U.S. economy. Over the years, I have also been heavily involved with wellness and nutrition .. especially Stem Cell Research. Combining my “Master of Photography” skills, along with my passion of helping people achieve optimal health and renewing their Youth with balanced stem cell nutrition .. I am known as the Erie PA Photographer that Guarantees to make his clients LOOK .. and FEEL .. their Very BEST ..! Being a respected Erie PA photographer that has won many international photography awards,I stress to everyone that 'OUTSIDE GOOD LOOKS' should take a "back seat" to that of renewing , repairing and rejuvenating their body's organs and tissues on the “INSIDE”, by maintaining optimal levels of OXYGEN and STEM CELLS in the Blood. Personally, I have a fresh supply of Millions MORE New Adult Stem Cells released from my bone marrow.. into circulation into my Blood stream ... every 6 to 8 hours. I take 6 or more stem cell nutrition capsules..and 6 circulation enhancer capsules EVERY DAY. After all.. I have to maintain my good Health..and Youth. I also take 15 drops of Liquid Stabilized OXYGEN Drops 3x Every day. I wake up in the morning feeling youthful and full of Renewed Energy I consider having MORE CIRCULATING STEM CELLS and MORE OXYGEN in my Blood on a daily basis ... “My Natural Fountain of YOUTH”! My mission now, is to help educate others, thru out the World, on the importance of renewing and rebuilding their bodies, with balanced stem cell wellness , improved Oxygen Levels and consistent exercise to live a long, healthy ,happy and productive life. CLICK HERE .. witness VIDEOS ,RESEARCH and TESTIMONIALS that Can Improve Your LIFE..and Your LIFESTYLE ! Then .. I show people how to optimize their Health Options by supplying them with knowledge of how THEIR OWN STEM CELLS .. that’s the Stem cells present in their body from the moment they were born, are their body’s Natural Renewal System . we have a New Heart every 15 to 20 years..
Life is GOOD.. But YOU are in the CONTROL SEAT To Make the RIGHT DECISIONS.. and CHOICES .. especially HEALTH-WISE ! NEW YORK, NY, March 1, 2013 -- Master Photographer, EJ Morris, has been selected for the 2013 Best of Erie Award in the Photographers category by the U.S. Commerce Association (USCA). This is the first year that a business has qualified as a SIX-Time Award Winner. Various sources of information were gathered and analyzed to choose the winners in each category. The 2013 USCA Award Program focuses on quality, not quantity. Winners, like Erie PA Photographer EJ Morris, are determined based on the information gathered both internally by the USCA and data provided by third parties. The USCA was established to recognize the best of local businesses in their community. Our organization works exclusively with local business owners, trade groups, professional associations, chambers of commerce and other business advertising and marketing groups. Our mission is to be an advocate for small and medium size businesses and business entrepreneurs across America.